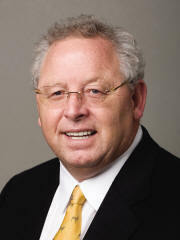 Herb Krumsick is the 2011 recipient of the Kansas CCIM chapter and WSU Center for Real Estate Lifetime Achievement Award. Mr. Krumsick is a legend in Wichita’s commercial real estate circles, having brokered, bought and/or sold more than $1 billion of real estate investments during his 45+ years in the industry. Highly sought after as a speaker and instructor on commercial investment topics, Mr. Krumsick has given over 285 speeches and seminars for various groups, including the Society of Industrial & Office Realtors, the National Bar Association, the National Association of Corporate Real Estate Executives, and the CCIM Institute, among others. In 1990, he was recognized by the Society of Industrial & Office Realtors as the Instructor of the Year. Mr. Krumsick holds several prestigious commercial real estate designations, including the CCIM (Certified Commercial Investment Member), SIOR (Society of Industrial & Office Realtors), CRE (American Society of Real Estate Counselors) and FRICS (Fellow – Royal Institute of Chartered Surveyors) designations. Among his professional honors and recognitions are the Howell Watson Award for Distinguished Service to the SIOR, the Walter Morris Broker of the Year, and the SIOR Largest Dollar Volume Transaction Award (multiple years). A 1965 graduate of Wichita State University, Mr. Krumsick was co-captain of the football team. He has continued to serve WSU through the years, working with the WSU Foundation, the Alumni Association and the Athletic Association. Mr. Krumsick is the seventh recipient of this award, joining Colby Sandlian, the late Jack Hunt, George Ablah, Jack DeBoer, Michael & Nestor Weigand, and Stephen L. Clark.